Testosterone Sleep and Libido! Natural Insomnia Treatment! A recent study out of the University of Chicago, focused on testosterone levels in 12 healthy men. Blood samples were taken and tested for total and free testosterone. In addition, the participants sleep patterns were monitored during the study period. Analysis revealed that the amount of night time sleep was an independent predictor of the subjects total and free testosterone levels. In other words, the men who got the most sleep, woke up with the highest testosterone levels the next morning. Human growth hormone levels are also closely tied to sleep. HGH is produced naturally in the body, during deep or slow wave sleep. A man in his early 20's will spend approximately 20% of his nightime sleep in this slow wave mode. By the time a man hit's his mid 30's this deep sleep drops down to about 5% of total sleep time. By the age of 45, most men spend very little time in deep, slow wave sleep. These sleeping patterns correspond with declining levels of growth hormone in men as they age. Sleep Apnea Testosterone and Libido! Sleep apnea is a respiratory disorder that affects 4%-9% of adult males. Its most common manifestation is loud snoring and it may occur several hundred times throughout the night, resulting in sleep fragmentation and excessive daytime sleepiness. A recent study, reported in the July issue of The Journal of Clinical Endocrinology & Metabolism, found that nearly half the subjects who suffered from severe sleep apnea also secreted abnormally low levels of testosterone throughout the night. I'm a strong believer that most cases of sleep apnea are caused by food intolerances. I've had quite a bit of success treating this condition by putting my clients on a paleo type diet of meat and fruit. Once the symptoms disappear, add in other foods slowly until you discover the true culprits, then eliminate them from your diet. The most common offenders are dairy, wheat/gluten, nightshades, corn, tree nuts, and soy. ZMA will take you down into SLOW wave sleep, and keep you there longer. 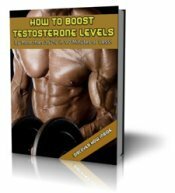 The end result is higher blood levels of Human Growth Hormone and free testosterone levels. Men who regularly engage in HIT exercise have fewer episodes of sleeplessness. Exercise promotes improved sleep quality by allowing smoother and more regular transitions between the cycles and phases of sleep.